In the previous sections, I cover the basic concept of a spreadsheet application, discuss the end users and developers of such applications, and even attempt to figure out why people use spreadsheets at all. Now, it's time to take a look at the types of tasks that are appropriate for spreadsheet applications. You might already have a good idea of the types of tasks for which you can use a spreadsheet. Traditionally, spreadsheet software has been used for numerical applications that are largely interactive. Corporate budgets are an excellent example of this. After the model has been set up (that is, after formulas have been developed), working with a budget is simply a matter of plugging in amounts and observing the bottom-line totals. Often, budgeters simply need to allocate fixed resources among various activities and present the results in a reasonably attractive (or at least legible) format. Excel, of course, is ideal for this. Budget-type problems, however, probably account for only a small percentage of your spreadsheet-development time. If you're like me, you've learned that uses for Excel can often extend well beyond the types of tasks for which spreadsheets were originally designed. ■ As a presentation device: For example, with minimal effort, you can create an attractive, interactive, on-screen slideshow with only Excel. PowerPoint is a better choice, but Excel will do in a pinch. 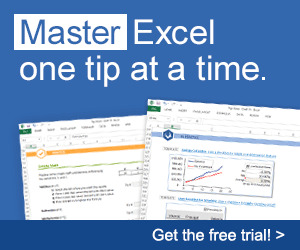 ■ As a data-entry tool: For repetitive data-entry tasks, a spreadsheet is often the most efficient route to take. The data can then be exported to a variety of formats for use in other programs. ■ As a database manager: If you're dealing with a fairly small amount of data, you may find it much easier to manage it using Excel rather than a program like Access. ■ As a forms generator: For creating attractive printed forms, many find it easier to use Excel's formatting capabilities than to learn a desktop publishing package. ■ As a text processor: Excel's text functions and macro capability enable you to manipulate text in ways that are impossible using a word processor. ■ As a platform for simple games: Clearly, Excel was not designed with this in mind. However, I've downloaded (and written) some interesting strategy games by using the tools found in Excel and other spreadsheets. You can probably think of many more examples for this list. Ironically, the versatility of spreadsheets is a double-edged sword. On one hand, it's tempting to try to use a spreadsheet for every problem that crops up. On the other hand, you'll often be spinning your wheels by trying to use a spreadsheet for a problem that's better suited for a different solution.